This Collection of Apple Tart Recipes is sure to inspire you to bake mini, individual serving size apple treats! Unlike many other fruits, it seems almost everyone LOVES pastries and other delectable homemade baking made with apples. What I really like about making apple tarts is that they are so easy to serve. There is no need to cut the baking into individual servings. Tarts and tartlets also look great on serving platters or pastry stands along with other baked goodies such as squares, bars, and cookies. ★ If you are looking for Apple DESSERT Ideas, here are additional links to Apple Recipes for serving the best apple treats! In the autumn, when all the apple orchards around my home are harvesting the apples, I can't wait to begin baking all types of apple treats. 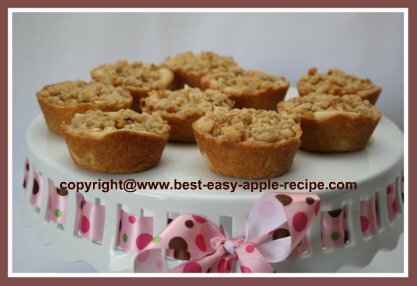 Apple tarts are always near the top of my "to make" list! I usually double or triple the recipe to begin with because they don't last long around our home!